Serving the best Greek & Italian cuisine since 1990! Great food and great friends is what Zorba's is all about. 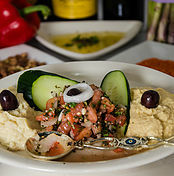 Browse our menu of authentic and expertly prepared Greek and Italian food cuisine. Zorba's also has a full bar of spirits, plus hand-selected wines and beer. We offer daily lunch and dinner specials, and you'll find we have something for everyone.